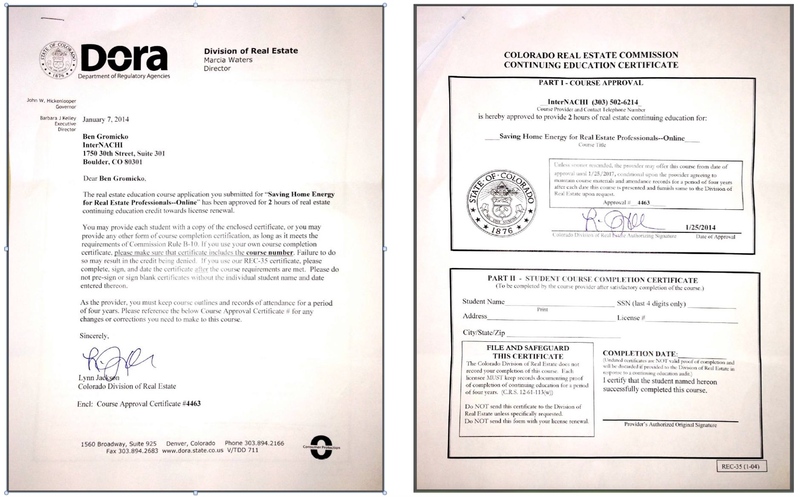 The State of Colorado Department of Regulatory Agencies (DORA) Division of Real Estate approves InterNACHI as an accredited School for providing free, online Continuing Education to licensed real estate agents. Ben Gromicko, online course instructor. Arthur "Ray" Kline, live class instructor. Home Energy Efficiency for Real Estate Professionals Course. Online course #4464. 4 hours. Expiration 01/25/2017. Home Energy Score for Real Estate Professionals Course. Online course #4465. 2 hours. Expiration 01/25/2017. Saving Home Energy for Real Estate Professionals Course. Online course #4463. 2 hours. Expiration 01/25/2017. Home Energy Efficiency for Real Estate Professionals Class. Live class #6563. 4 hours. Expiration 03/25/2019. Arthur Kline, live class instructor. The State of Colorado requires all active real estate brokers to complete 24 hours of continuing education during each three (3) year license cycle. For details, visit the Colorado Department of Regulatory Agencies website. View approval of Home Energy Efficiency Course. Online course #4464. 4 hours. Expiration 01/25/2017. View approval of Home Energy Score Course. Online course #4465. 2 hours. Expiration 01/25/2017. 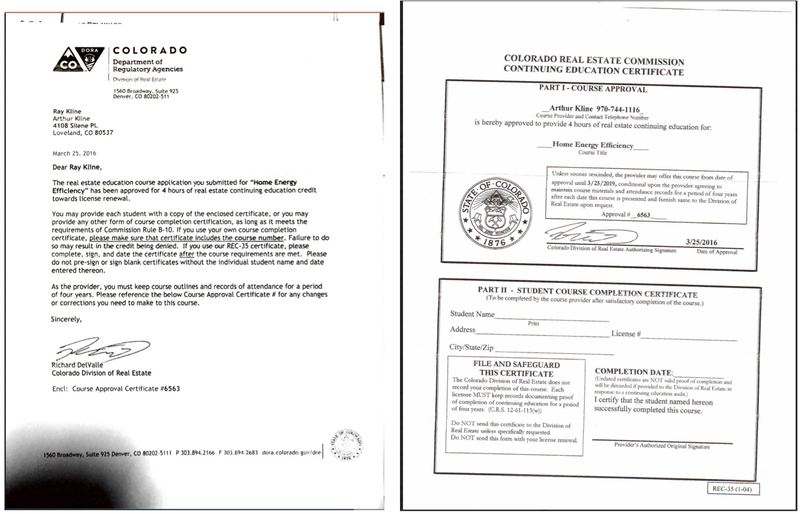 View approval of Saving Home Energy Course. Online course #4463. 2 hours. Expiration 01/25/2017. View approval of Home Energy Efficiency for Real Estate Professionals Course. Live class #6563. 4 hours. Expiration 03/25/2019. Arthur Kline. Inform Colorado-licensed real estate agents that they can attain free, online Continuing Education provided by InterNACHI. Give an agent a real estate card that provides simple instructions on how to register and access the free, online education. Agents may visit nachi.org/coagent and register on that page. When a real estate agents logs into a course and enters an InterNACHI member's ID number, the member will be automatically notified by email. Inspectors can order free cards.